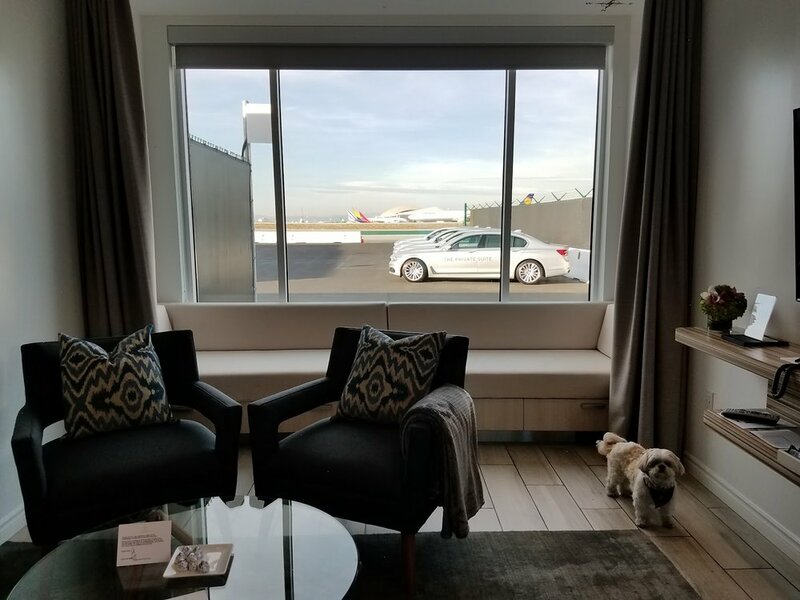 -When I approached LAX, I was dropped off at a private terminal that's nowhere near the departures check in, meaning I avoided all that traffic going to the airport. -Dedicated staff checked me in (including my luggage) and got me cleared to fly while I waited comfortably in a private suite. I didn't interact with any Delta agents. -The private suite had floor-to-ceiling windows of the runway (you can watch planes take off), sofa, TV, WIFI, a full bar, a full snack/beverage station with premium snacks (if you want to order food they also have a menu for that), private bathroom with Kiehl's amenities, basically a medicine cabinet with everything you can imagine (from over the counter drugs to toothpaste), chargers, amenities for your flight and more. This was SO much better than waiting at the gate of an airline's VIP lounge for your flight. -I cleared security in a private TSA area where there were NO OTHER PASSENGERS. -20 minutes before boarding, my staff drove me in a private BMW across the tarmac, directly to the plane. I boarded the plane through the back steps, and I was the first on the flight, before they had begun boarding at the gate.